NIA CHARLESTOWN NEVIS (August 20, 2014) — The Subsidised Utility Programme which was introduced on Nevis for senior citizens over 65, in October 2013, by the Ministry of Social Development has been reaping benefits and to date at least 240 persons continue to receive assistance through it. That disclosure came from Junior Minister on Nevis responsible for Social Development Hon. 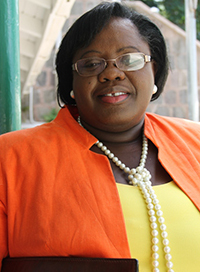 Hazel Brandy-Williams, at a recently held town hall meeting which was hosted by the Nevis Island Administration (NIA), at the Red Cross conference room in Charlestown on August 14, 2014. The Junior Minister was at the time presenting an account of her stewardship in the areas she had been assigned 18 months ago. “For each senior over 65 living on their own with one standard income, the Government is subsidising $150 for their electricity and $30 for their water and so, to date, we are spending on average some $21,000 on electricity and over $4,000 on water for our seniors. “I am indeed heartened because the reviews that we have been receiving is overwhelming. Seniors have indicated that they are now seeing some tangible benefits from this programme. Their one income is now being able to stretch a little further because they are now able to save $150 on their electricity and 10, 20 or $30 on their water,” she said. Mrs. Brandy-Williams also reminded of the ongoing programmes tailored for the needs of seniors, among them the Intergenerational Programme and the most recent introduction, the Fit and Wellness Programme. “They also have a very important programme which is dubbed the Inter-Generational Programme, where they visit a particular school and they interact with the students from time to time. This programme, as well, has received great reviews from the seniors because they feel that they are now reliving their lives through the students of the school that they visit. “There is another programme that has been introduced and I must make mention, that last month, we introduced a new programme where our Fit and Wellness Division is going to our seniors and they are administering massage therapy. It will be officially launched in October,” she said. According to Junior Minister Brandy-Williams, a civic-minded cooperate citizen had donated a bus that would be used to transport officers of the Fit and Wellness Division to seniors who were in need of therapy. “We will launch it [Fit and Wellness Programme] with a bus which we have received from a good cooperate citizen. I must say here, thanks to AMS Financial Services who has come on board and has donated a bus, so that our officers would be mobile to go to the respective seniors and administer massages to those persons who would have suffered strokes or due to ill health and old age, are having some difficulties moving around,” she said. However, the Minister noted, that that programme would also cater to persons who were not seniors who were afflicted with debilitative illnesses and required therapy. “I must say it is not only for seniors but they are also administering this form of therapy to younger persons [who] might have suffered a stroke or the bends [decompression sickness]. There are some cases where we have persons who would have suffered the bends and are also open to this form of therapy as well,” she said. Other ongoing programmes offered to seniors on Nevis by the Seniors Unit in the Ministry of Social Development, include weekly meetings in various communities where they are exposed to training in first aid, arts and crafts, ballroom dancing and cultural activities among others.